This week marks the annual travel and hospitality awards – the Freddies – and I attended. Actually, that’s a bit confusing, because as I write this I haven’t been there yet, but as you read it I have. The Freddie awards were named after Sir Freddie Laker by the team at Inside Flyer many years ago. The awards are now run by Global Flight. (Beyond that I won’t bore you with any more of the background.) I’d attended the awards once before, but this was the first year I’ve been asked to speak at them. 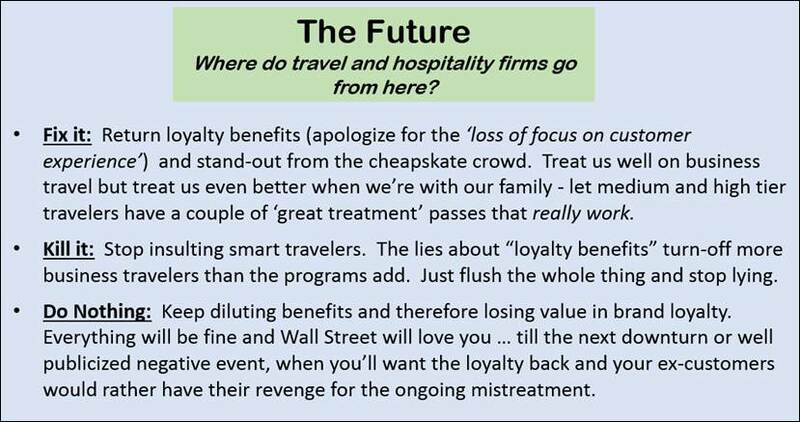 The team running the program asked me and a couple of other people who represent the view of the business traveler to present our thoughts on the current state of loyalty programs. 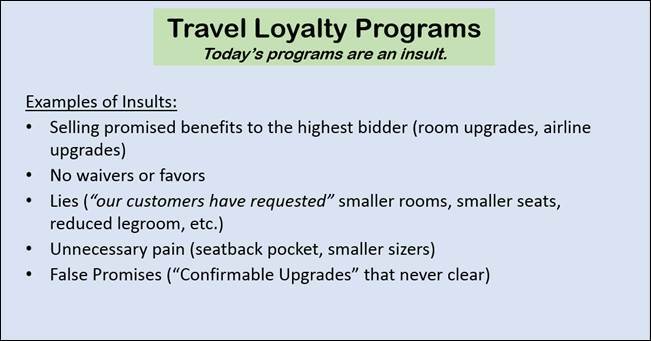 The brief segments were called “I have a dream – a frequent traveler’s view on loyalty programs.” I have a view all right - my presentation was called “what loyalty” and I’ve excerpted it below for those that didn’t attend. The first point I made was explaining what loyalty meant – that it was a two way street. And as many of us frequent travelers know, the travel and hospitality industry have so watered down the benefits of being loyal that the two way street is non-existent. Many travel experts are saying there’s almost no point to striving for elite levels in the travel programs anymore. 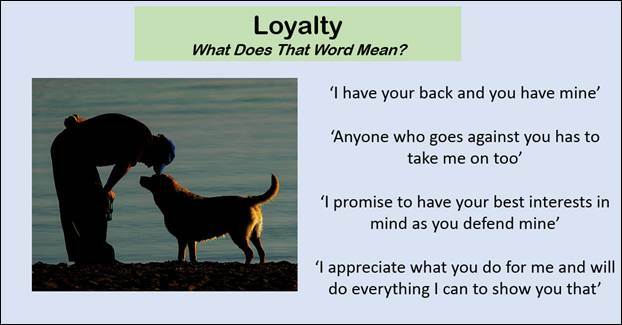 Interestingly, when I prepared this presentation, I used that picture of a dog being beaten-up to illustrate the state of loyalty. Little did I know I’d have a readily available video of a passenger being beat-up that I could have (and did) use. I then pointed out how the loyalty programs actually insult more people than they attract. 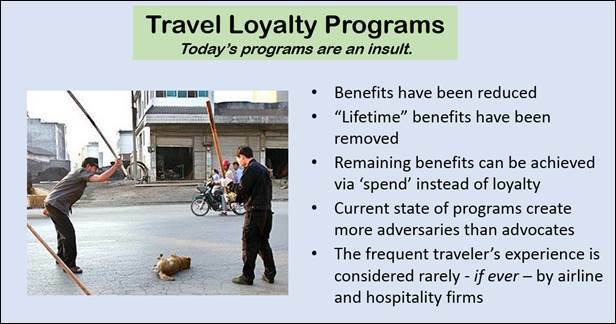 When a formerly loyal patron fulfils their part of the “bargain” but the travel and hospitality industry doesn’t, it causes more harm that not having the program in the first place. I detailed the insults in the very simple and clear terms above. 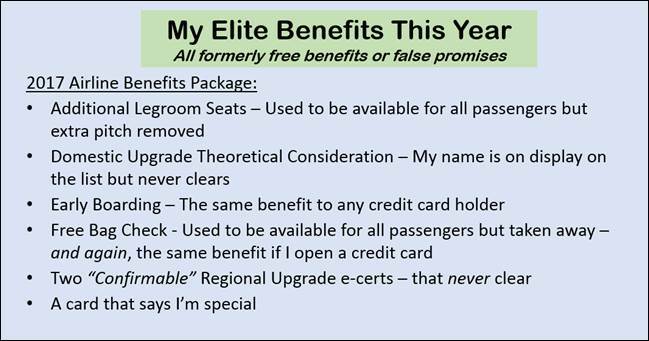 Most of the benefits I receive from the “lifetime” levels I’ve achieved and the current nearly top levels I hold in a few programs are actually available if I’m just some poor schlep that opens an affinity credit card. Some other benefits aren’t really benefits at all – but are rather things that were taken away from everyone else, but I “should feel lucky” that I was spared the take-away. 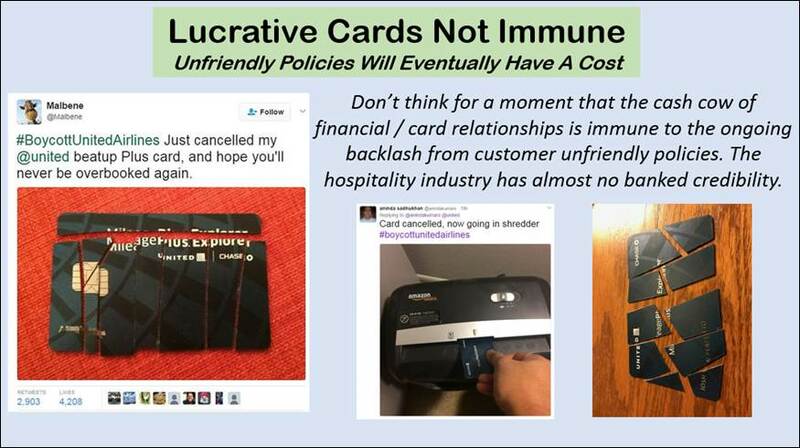 And those affinity credit cards – they are currently the golden-goose of the travel and hospitality industry. The airlines and hotels print their own money in the form of points and miles, and sell it to the banks for whatever price they name – and people use the cards because they want those points. They make more money off of those bank transactions than off providing actual services. I then made a key point. The airline and hospitality industry have nothing left in the traveler’s credibility bank. It only takes one incident – an overzealous FA or a misinformed airport guard or whatever that next incident will be - and people will react by cancelling that credit card (and killing the associated golden-goose of free-printed money) as I showed with just a handful of the dozens of pictures that were posted to the internet after the United beating incident. (Oh, sorry – I guess I have to be more specific as United flyers take a beating every day they fly.) This was the recent one where the passenger was physically assaulted. (Oh, wait – the United coach seats physically assault all travelers daily here again.) This was the one where a passenger was bloodied and dragged off a flight, and the CEO was so out of touch he actually initially supported the crew that did it, calling the passenger “disruptive” (until video showed that to just be another airline lie.) It’s stunning to understand that an airline CEO could see that video and be completely unable to see something wrong until it’s pointed out, and that’s just as stunning as it will be for the airlines when they suddenly lose all their free-printed-money and didn’t see it coming. To close my presentation, I provided the three options above. Nowadays, just about every business in the world is adopting a “put the customer experience first” approach to the future. The travel and hospitality industry could do the same, with some easy and relatively inexpensive steps. I doubt that they will – their management is generally too greedy and stubborn. The second option is to just pull the plug on all of it. Travelers know that the airlines and hotel chains are lying to them. It would do less damage to promise nothing and deliver nothing than it does to promise everything and deliver nothing. I doubt they’ll do that one too. The third option is most likely the one they’ll choose – to move blindly forward, lying, overpromising and under delivering the most basic of services. That will seem like the best option to the industry – until whatever the next incident is that causes the stock to drop and credit cards to get cut up. At that time they’ll once again need to dip into that bank of good will and find it completely empty, having dried up from lack of attention for years and years. And then, despite my presentation and hundreds of articles like this one from dozens of business travelers who take the time to write, the airline and hospitality industry management will tell the Wall Street investors that no one could have seen it coming.